Casually checking out the line-up for this year's Bloodstock festival, my eye caught a familiar-looking logo that I hadn't seen in a long while... 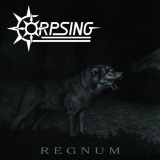 Corpsing?! The creators of one of my favourite ever death metal albums, 2007's The Stench of Humanity, the London-based band split up shortly after its release and have been dormant until now. Furiously googling, I discovered from Bandcamp that in May Corpsing self-released a new EP, and it's been on my playlist since. It's like they never left us; that brutally heavy guitar tone instantly recognisable, forming the backbone of the complex and often chaotic music, progressive and diverse without being obnoxious about it. Even the sense of humour is intact, intro Dancing Shadows setting the scene with dripping water and murky ambience before a child's voice says 'oh my god' - launching straight into first track proper Bloated Enigma. Rounding things off with flamenco outro Divna and, oddly, a cover of Emperor's Ye Entrancemperium given a death metal bluntless and aggression altogether different from the original, Regnum is a bountiful of riches and something of a walk down memory lane for those, like me, who remember the band from back in the day. Listen to and purchase all of Corpsing's output from the Bandcamp link above, and go see them live if you're lucky enough to be off to Bloodstock next month.